Alright, you primitive screwheads, listen up! You're in a strange land, with strange people, and you're not thinking too clearly. The natives are suspicious, the leaders hostile, the priests cryptic, and no one's bathed in months. Advanced tech is a hole in the ground filled with sewage. The basic food groups are roasted haunch, moldy bread, and watered-down wine. Getting home ain't going to happen anytime soon. First you need to find some stupid book, then recite some stupid phrase, then bring the stupid book back to the stupid castle. Heck, there's probably a bunch of other stupid stuff you have to do. Just nobody's told you about that yet. Oh, and then there's the army of undead just over the hill looking to gnaw on your soul! Ash: That’s it. Go ahead and run. Run home and cry to mama. Me! I’m through runnin’. I say we stay here and fight it out! Arthur: Are all men from the future loudmouth braggarts? Ash: Nope. Just me baby . . . just me. • An introduction to roleplaying and the Army of Darkness story. • A guide to character creation, including ready-to-play champions and companions, as well as specs on the Army of Darkness Cast, for your quick-play pleasure. • The Army of Darkness Unisystem, streamlined for cinematic action and adventure. • Guidelines for bringing the little people together, training them, and pitting them against the forces of evil. 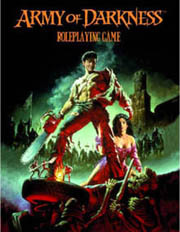 • Blow-by-blow instructions for creating Army of Darkness roleplaying game sessions. • A rundown on the Army of Darkness setting, places, people, events, including details on evil clones, demons, undead, and other critters. • Fleshed-out new setting suggestions, taking your Army of Darkness game in freshly gruesome directions. • A complete adventure to get the horror and hilarity under way right away. • Players can re-enact the movie as Ash or create their own characters and play in the setting. • Zombie killing fun! Everyone loves Zombies! and don’t forget chainsaws! • Easy gameplay. Makes for great one-shot game sessions. • Can be played seriously or campy. • Army of Darkness is a cult hit amongst gamers. • Compatible with other Unisystem roleplayng games.